Just after Christmas I received a package from my brother (sent well before I should point out) containing a nifty little 8 in 1 card reader with a USB connection and a 2 Gb SD memory card. Together they’ve replaced my need for a dongle as I now can switch the SD card from my camera to my “dongle” whenever I feel like it. 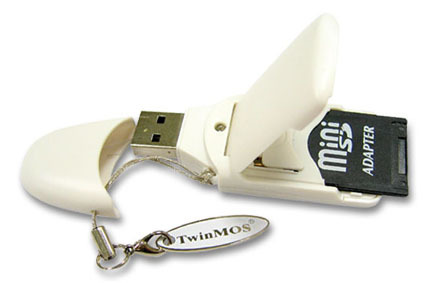 TwinMOS´s 8 IN 1 card reader/writer integrates eight digital storage cards into one device that provides you shortening the data storage, retrieval times and maximizing efficiency between PC and flash memory cards. The white color compact & modern design with lightweight will be convenient for consumers to carry anywhere. TwinMOS´s 2 Gb 150X Ultra-X SD cards are an especially ideal for high-resolution professional digital cameras and digital camcorders which require a high-performance SD card for taking continuous shots. What attracts users to Ultra-X Secure Digital card is its lightweight, small size and the CPRM system preventing data from being illegally duplicated. It provides the consumers with maximum security and privacy as they store and retrieve multimedia content. Why would this be so interesting you might ask, well for one the data transfer is ULTRA fast. A full SD card will be copied in less than 5 minutes, while it might take a little more to fill it. You also don’t have to drag around USB cables and other crap to get your photos on to the computer at the Internet café while on holiday/business. Friends might even appreciate it as you can easily allow them to borrow the reader to get their photos on the way/web as well.